Dushnamub is an Orc warrior and resident blacksmith for Narzulbur, the Orc stronghold in Eastmarch. He is the son of Chief Mauhulakh, and brother of Urog. Dushnamub comes out of the longhouse around 8am and heads down to the forge to work. He doesn't offer any services until he is in place, and the walk can take him about an hour. At 8pm he heads back into the longhouse for dinner until going to sleep at midnight. Dushnamub wears a set of hide armor with a matching pair of boots. He wields a leveled warhammer, which can be up to Orcish in quality starting at level 6. He also carries a selection of lower class loot and gold. His mother died giving birth to him, and he was raised by his great-aunt, Bolar. He is aware that his tribe is not common with Orcish tradition and will state so when approached. "Haven't you seen how my aunts act with my father? It's beyond strange." Dushnamub's suspicions about what is really going on have led him to distance himself from the rest of the tribe. "I never knew my mother, but I doubt she ever acted as affectionate with my father as Yatul and Bolar do." Attempts to convince his sister to do the same have not worked out. "My sister is blind. I told her not to spend so much time with Yatul, but she won't listen. Thinks she's nice." When he leaves to find a stronghold of his own, he wants it to be somewhere far away from Narzulbur. 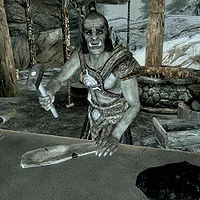 In addition to his blacksmithing services, if you have any ebony ore, Dushnamub will purchase it from you. This is the merchandise found in Dushnamub's Merchant Chest. These items are only available if purchased from the merchant; they cannot be pickpocketed or stolen. They are restocked every two days. This page was last modified on 3 May 2013, at 20:42.